I was drawn to include a lizard in a painting for a couple of reasons. I had been intrigued by the many tiny lizards in our backyard and that there are over 520 species of lizards in Australia. These species belong to five main families of lizards: Geckos, Legless lizards or Snake lizards, Dragon lizards, Monitor lizards or Goannas and Skinks. Many of these lizards used to provide an important source of food for Aboriginal people, which in part contributes to Lizards being one of the dominant features in Aboriginal art. I was also aware that the lizard in the Native American tradition is associated with dreaming. From my Medicine Card book I knew that the Lizard medicine is the shadow side of reality where our dreams are reviewed before we decide to manifest them physically. The medicine card set included a colorful image of a lizard. The image also was simple enough for me to draw and to use as a blueprint for a lizard in my painting. 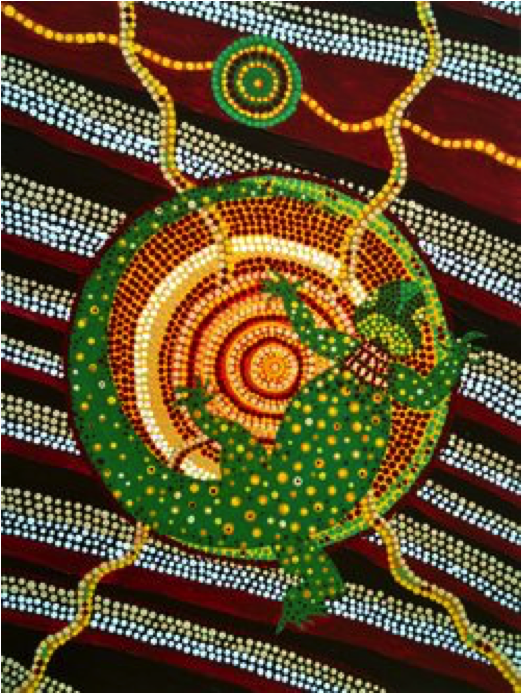 In addition the medicine card depicts the lizard from the aerial perspective which is the perspective used in most aboriginal paintings. The symbols seen in many aboriginal paintings, particularly those from the Central Desert Region, are aerial views of songlines, animal tracks, people, gathering places, bush foods (bush tucker), waterholes, sand, rock formations, etc. Many paintings seem to be kinds of maps that illustrate non-proportionate layouts of a certain area and seem to reveal a snapshot of the story that each painting represents. The background of my painting is composed of a number of patterns and motifs that I found in the book Tradition Today: Indigenous Art in Australia (Art Gallery NSW). I chose slanted lines of dots, curvy lines, and nested circles because I was attracted to and familiar with them from aboriginal art I had seen elsewhere. I suspected that the curvy lines might represent songlines. Otherwise, at that point, I was still unaware of what these patterns and motifs represented. My focus was more on how to work with acrylic paints and dot technique, and the contemplative awareness and feeling that were generated as part of the process. It certainly seemed that the lizard would be an appropriate totem for me given that I was at the beginning of a transition after having left the United States and my tenure track position at the university. I had even shared with some that I felt I was entering into a kind of invisible world; a world or space that is more in the shadow or margins of things rather than the extroverted and social space I had been in the last few years. I was also highly aware I had just turned 45 years old and that I could use this transition to more fully explore the questions that usually show up at this juncture in peoples’ lives. I had already accomplished much and now I was wondering in a new way what I would truly want to do if external recognition no longer played a role. Who would I become, if I had already fulfilled the purpose of the motivations I had inherited from my early upbringing? Would I be more at peace and settle more into my authentic self? And, what if, I fully stepped into the transition before me to move toward the vision I was beginning to create for the second half of my life? I painted the lizard to honor my own time of dreaming and visioning of the future, and the period of incubation I was stepping into. Like the lizard in the painting, I was held, almost confined, and in places indivisible of the circle of incubation. During the early months here I stayed close to home and reached out to only a few individuals. I chose not to drive for a while and try to take care of my errands in the local neighborhood. Having moved to a new country and an urban environment I was unfamiliar with, I just needed to stay close to our new home and ‘land’. Internally I practiced letting go of others and my own expectations and motivations ‘to be’ someone, asking silently the questions about the second half of my life, and putting my focus on whatever authentic call would emerge. I sat waiting, noticing, letting go and sometimes grieving familiar aspects of my life and identity, especially of my professional identity, that I had left behind in order to clear the space for what is to come. Listening deeply and letting the dreams come was what was needed the most. Silently I also held with care the commitments and choices that with no doubt are part of my future. It is helpful for me to notice that which is certain, when uncertainty in some parts of my life opens the door to reveal deeper and unfamiliar aspects of myself. It was with these questions and commitments in my heart that I created this painting.